The injury bug has bitten the Serbian women again. 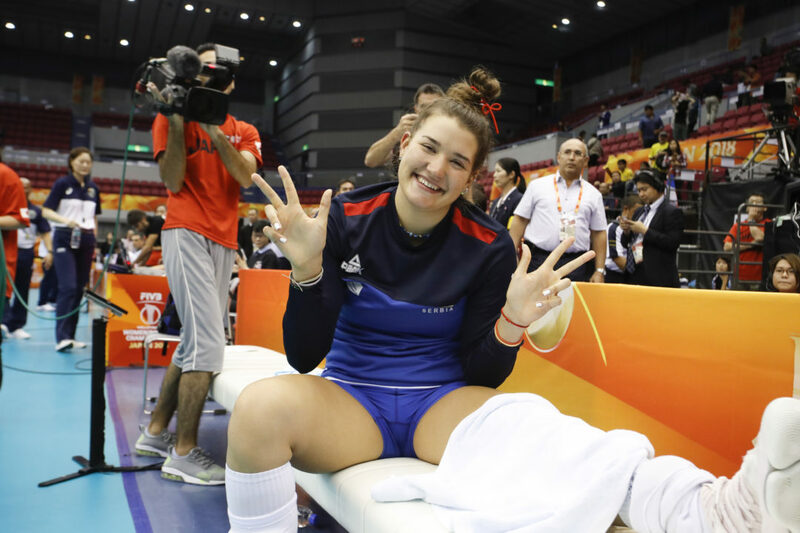 In Thursday’s preliminary-closing 3-0 win over Puerto Rico, Bojana Milenkovic went down with a knee injury and will miss the rest of the World Championships. According to team doctor Dejan Aleksandric, the injury was a tear to her ACL. She was injured at 9-8 in the 2nd set when she landed awkwardly on her left knee after a spike and had to be helped off the court. The 21-year old outside hitter scored 26 points in the preliminary round of the tournament. She was used as a reserve in most matches, but got the start in a game against Puerto Rico in which the Serbians were heavily favored. She also played the entire match against Brazil, Serbia’s most important opponent of the preliminary round, which they swept in a surprisingly-easy 3-0 fashion. She only scored 6 points there with Serbia’s dual monsters of Brankica Mihajlovic and Tijana Boskovic recording 36 of Serbia’s 56 kills. She left Thursday’s match with 7 points on 5/11 hitting and 2 blocks. Bianka Busa finished the last half of the game and earned 4 points on 4/9 hitting. As the matches become more competitive in the 2nd round (Serbia didn’t lose a set in the first), the team will have Busa and Tijana Malesevic available at outside hitter. With such an easy route through the opening round, Serbian coach Zoran Terzic hasn’t had to show his hand as to which he prefers as the tournament goes on, though defense ultimately plays a huge role, given how much of the team’s offense is already accounted for. Milenkovic is signed to play for Pallavolo Scandicci in Italy’s Serie A next season: her first professional season abroad.